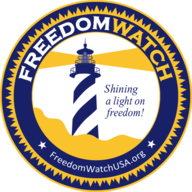 Freedom Watch has been very active over the years in trying to bring freedom to the Iranian people in the Islamic Republic of Iran, a repressive, radical Islamic regime that has killed people, some of our clients in the past. The great Akbar Mohammadi was slaughtered. He was one of the leaders of the student movement in 2009. And now of course, the people of Iran are rising up again. We are playing a role, because we have several lawsuits involved with Iran against the regime, not just with regard to people that were murdered inside of Iran or even in the United States, but Navy SEALs who went down in Extortion 17. And other Special Ops. 30 went down. And that attack by the Taliban was financed by Iran, and we're still going through the courts to bring about justice for that. Iran's future in terms of democracy and liberty is our future, and it's Israel's future, because if we can eliminate that regime it will make things a whole lot easier for Israel and the United States and the Middle East, because Iran finances and actually participates in terrorism. They support Hezbollah, they support Hamas, they support Assad in Syria, and they're waging a caliphate for themselves. Now we know that Iran is not generally Arabic. It's so-called Persian. But they have a radical aspect of Islam that is designed to take over the entire Middle East and the world. And we know that they have nuclear weapons, in all likelihood. They're partners with North Korea. So go to https://www.freedomwatchusa.org. We're doing our part to bring that regime down. FreedomWatchUSA.org. Contribute to our cause, because freedom in Iran is your freedom. God bless you. God bless America. And God save America.